Home / Beginner's Guide to Machine Quilting / Which Color Thread Should I Use in High-Contrast Quilts? Which Color Thread Should I Use in High-Contrast Quilts? 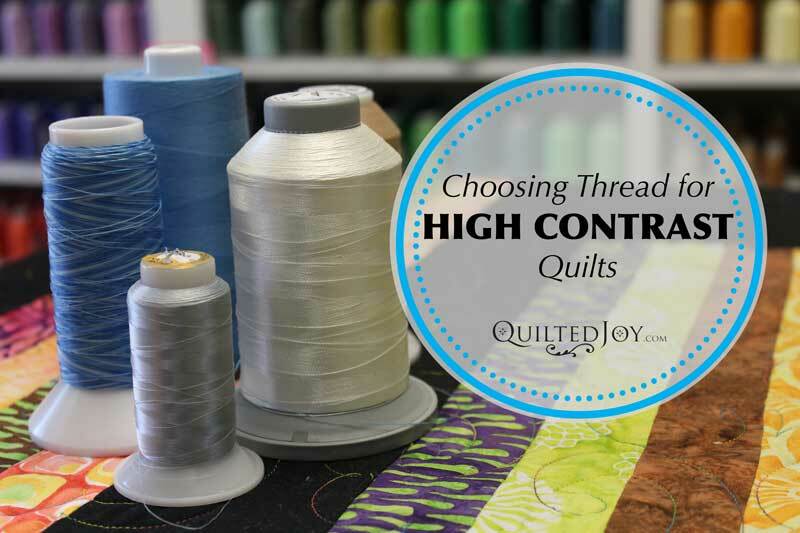 Recently, Kelli contacted me through the contact form at QuiltedJoy.com to ask for advice on choosing quilting thread for high-contrast quilts. I was hoping you could discuss in your blog thread choices for high contrast quilts. I keep getting red and whites, black with various colors but also white, scrappy and no two match…. The black thread looks awful to me on white…. The gray thread shows too bad on the black… White thread stands out all over. How to choose thread in high contrast quilts is currently my biggest challenge. I’m told invisible thread ruins thread guides and also won’t last a long time and may come unstitched or yellow over time. Please discuss! There are so many quilt styles these days that use fabrics that contrast strongly, whether they are black and white quilts, three-color challenge quilts, scrappy quilts, or even modern quilts. When machine quilting a high-contrast quilt, you are faced with a decision: which color should I use? I recommend auditioning several colors or shades of thread because you may be surprised by what works best. Unwrap about a yard’s length of each of the threads from the spool or cone rather than holding up the cone to the quilt. Lay each thread across the variety of fabrics in the quilt, light and dark. You will immediately see that some are more likely to blend than others. Another approach would be to “shoot for the middle” by trying medium tone threads, such as grey over a black and white top. In other words, seek out a color that would talk the same across all of the colors equally. One of my customers brought me a beautiful log cabin quilt. The fabrics flowed from dark blues to pale yellows. I started by comparing more neutral colors on the quilt. In the picture below you can see I laid out four threads. From top to bottom they are a silver Invisafil, Bottom Line Natural White, So Fine! Cashew, and Glide Linen. Can you see how each of them show off a little more in the blue fabrics but disappear in the yellow? Thank you for the VERY quick service of sending my order. I love the assortment packages you have. All my favorite colors. I ordered a package of 6 neutral Glide thread colors. The packaging was great and the hand written note is a great added detail. My machine loves this thread and it makes a beautiful stitch. It is my preferred thread now! Sheen also plays a role in what thread speaks softest. Below is a picture of similar colors of Omni and Glide thread laid out across the quilt. These threads are both polyester and are very close in weight, but Glide has more sheen than Omni. Thus, Glide will catch and reflect the light better and be easier to see on your quilt. Many people prefer a thread with a matte finish over a thread with a sheen for traditional quilts because it reflects less light. When working with high contrast fabrics, try out a variegated thread, such as Affinity or Fantastico. Especially good in scrappy quilts, a variegated thread combines the best of all worlds in a quilting thread that changes color about every inch or so. However, the down side is that you do not have control over what color ends up where – you may find dark threads landing on light fabrics, or the reverse. Of course, you could use a thinner thread so that whatever color you choose will not show up as easily. Thinner threads (remember the higher the number denoted for the weight, the skinnier the thread. Click here for more on thread weight!) are particularly useful when you are quilting a design that backtracks over itself. They also do not show as easily in edge-to-edge quilting as their heavier-weight counterparts. Examples would be MicroQuilter, Glide 60, So Fine!, The Bottom Line, Bobbin Line, or even a silk thread. In the first picture above, the four threads are in order from skinniest (Invisafil) to heaviest (Glide). Do you see how the Glide thread at the bottom is much easier to see than the Invisafil at the top? Glide’s 40 weight thread is much fatter than Invisafil’s 100 weight thread. See all the colors of MicroQuilter! See all the colors of Glide 60! See all the colors of Bottom Line! Invisible thread such as Monopoly or Essence would be another option to consider. Invisible thread comes in polyester and nylon and in clear and smoke colors. There are pros and cons to using this thread which we’ll discuss in a later post. However, this is a perfectly reasonable option used by quilters in situations where they do not want their stitches to be visible. Click here to learn more about invisible threads. Finally, you could make this a custom quilt and change out the colors as needed. The feasibility of this approach needs to be determined by your own schedule and the quilt that you’re quilting. If you quilt for others you’ll need to consider how changing out your thread colors frequently will affect the budget for your customer. So which thread did I end up using to quilt Imogene’s log cabin quilt? The quilting was going to be a very repetitive edge to edge design, so I wanted a thread that would talk evenly throughout the quilt. I opted for a denim blue Omni thread and I love how it turned out! You can really see the quilting design throughout the whole quilt, giving it lots of lovely texture, but it doesn’t steal all the attention away from Imogene’s hard work either. Do you have a question that you’d like to ask? Please do so in the form below and I may share it with our readers!